Experience: Japanese company, highly experienced with excellent quality in their manufacture ship. Color: Black (shown), White, Yellow, Grey, Bright Yellow, Silver, Light Silver, Metallic and many more. 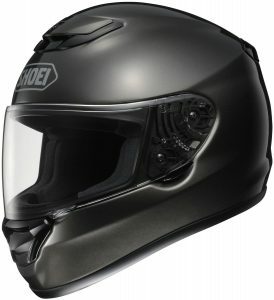 The Shoei Qwest Helmet features a slightly roundish oval inner geometry and is made with 4 different shell sizes. This is done since keeping the helmet shall smaller means that the weight is lighter. The minimal of weight is one of its main design focuses in mind, plus reducing noise and a optimal fit for protection and comfort. It endorses a tight sealing with the face shield via pulling the shield backwards so providing an opening of the seal evenly. A good peripheral vision is provided with a wide eye port, allowing to see the surroundings better.